Introduction: In this article, Mary Harrell-Sesniak finds birthday articles and notices in old newspapers to show how they can help with your family history research. Mary is a genealogist, author and editor with a strong technology background. I suppose there are people who don’t celebrate birthdays, but they’re hard to find. Who wouldn’t want to partake in this annual celebration of life? The Scottish writer Robert Louis Stevenson was the exception. In 1900, he bequeathed his birthday to Adelaide Ide, a little girl who had “carelessly” been born on Leap Day (29th February). Many accounts claim that she had been born on Christmas Day, but one of the wonderful things about historical newspaper articles is that they correct mistakes like this. 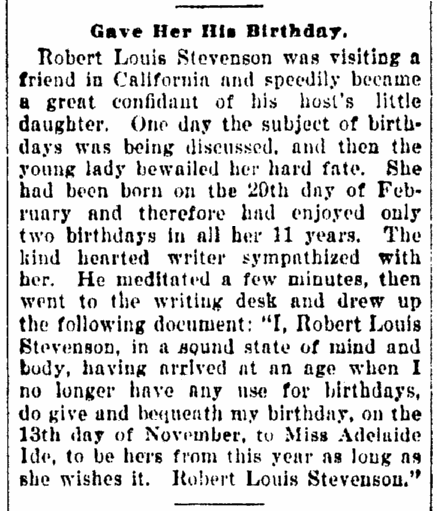 I, Robert Louis Stevenson, in a sound state of mind and body, having arrived at an age when I no longer have any use for birthdays, do give and bequeath my birthday, on the 13th of November, to Miss Adelaide Ide, to be hers from this year as long as she wishes it. Robert Louis Stevenson. What a delightful birthday idea! 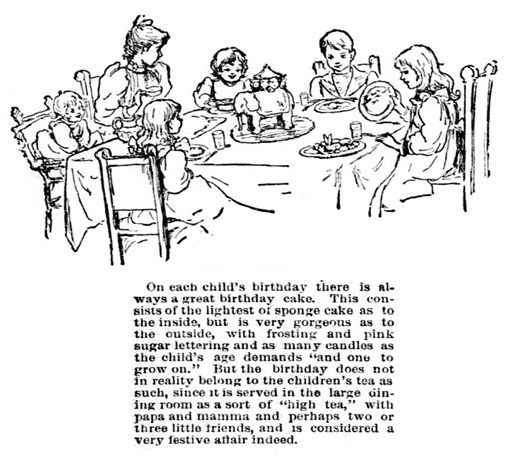 Newspaper articles round out our genealogical stories, so use them lavishly to learn how family celebrated festive affairs such as birthdays. 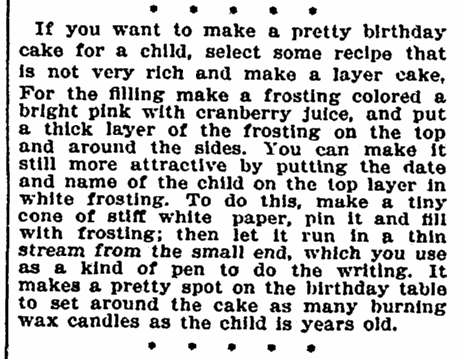 Many articles, such as this one from 1895, suggest hints for planning a child’s big day. This next newspaper article, from 1892, reminds us that high teas were in favor – but it also demonstrates that many birthday customs have not changed. As is practiced today, the child’s name was written in frosting on the birthday cake, which was decorated with candles to match her age plus one to grow on. 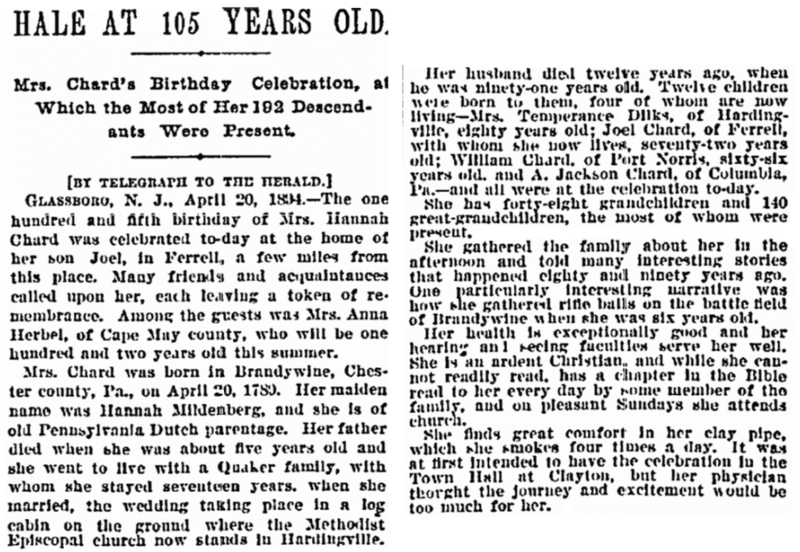 Birthday articles with the most impressive genealogical data spotlight celebrants who attain impressive milestones, such as this 1894 newspaper article reporting on the 105th birthday of Hannah Chard. This article notes where she was born, her birth date, her maiden name and some of her progeny. Facts and narratives are reported, such as how she gathered cannonballs at the Revolutionary War battlefield in Pennsylvania from the Battle of Brandywine. This 1800s newspaper article alludes to several timelines in Hannah’s life. Although she was of Pennsylvania Dutch heritage, Hannah came to live with a Quaker family around the age of five after her father passed away, and her husband’s death is reported as occurring 12 years earlier. If you were searching for pertinent dates, an old news article like this provides important leads. We also learn that Hannah enjoyed exceptional health at the age of 105, despite taking great comfort in smoking a clay pipe four times a day! An interesting genealogy aside: I have an ancestor who also found cannonballs at the Battle of Brandywine battlefield. 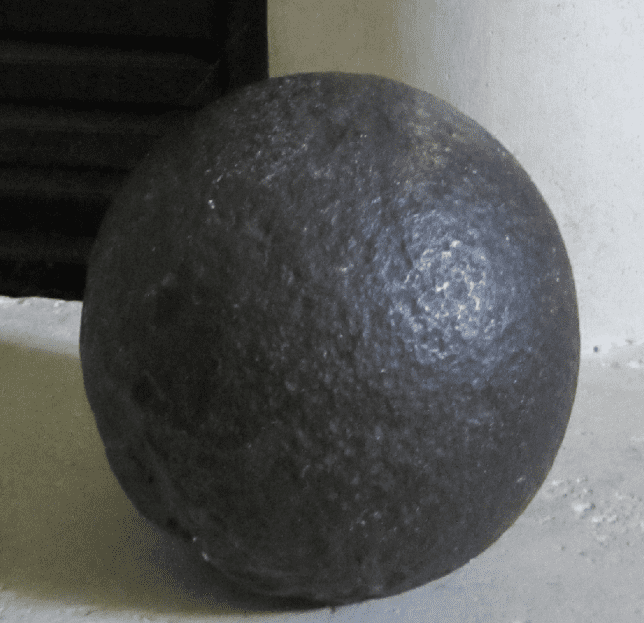 Photo: cannonball from the Battle of the Brandywine found by the author’s ancestor, Edith Scott. Credit: Mary Harrell-Sesniak. Surprise birthday parties frequently make the news, and those newspaper articles can identify family relationships helpful to your family history research, or sometimes describe gifts that may have become family heirlooms. 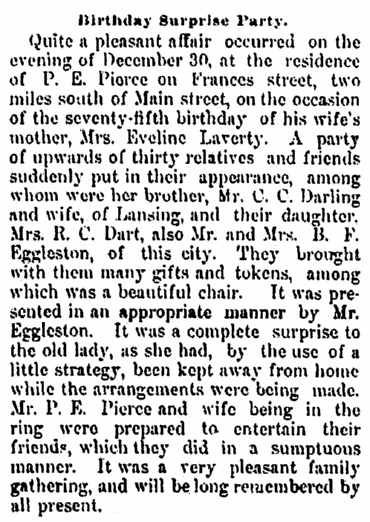 This 1880 newspaper article does both, noting three generations of family in attendance and a special chair. Mrs. Evelene Laverty turned 75 in 1880, and she was kept out of the house before being surprised by her son-in-law with upwards of thirty relatives and friends at her surprise birthday party. Two of the people attending were her brother and sister-in-law, the Darlings, a useful tidbit when searching for maiden names. Their daughter, Mrs. R. C. Dart, was also present. Surprise birthday parties are not always given by family members. 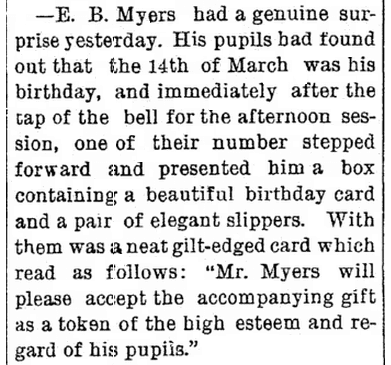 Mr. Myers will please accept the accompanying gift as a token of the high esteem and regard of his pupils. If you’re working on your family genealogy or planning a summer reunion, search old newspaper headlines for memorable events that occurred on the day someone was born, or on a milestone birthday. You never know what interesting facts you might discover about their date of birth. If you’ve found an unusual birthday notice doing your newspaper research, please share it with us in the comments. Do You Celebrate Birthday Traditions Like Your Ancestors Did?